What is it about the hills above Los Angeles that inspires great songwriting? Neil Young famously lived there, along with a host of '60s folk and country artists now influencing rising California band Dawes. After the breakup of his alt-rock outfit, Simon Dawes, Taylor Goldsmith turned the focus from volume to craft. 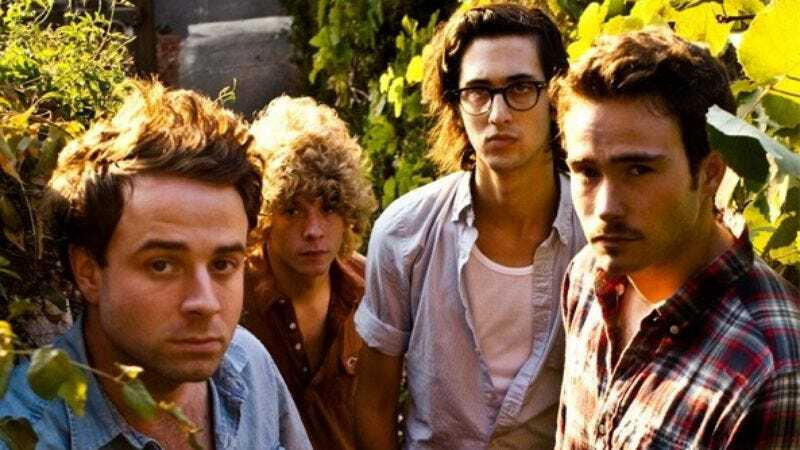 His new group, Dawes (Goldsmith's middle name), recorded its debut record, North Hills, on its own in early 2009, and followed it up with a year of heavy touring. ATO gave the record a wide release last August, poising Goldsmith's driven, honest songs to pick up more fans in 2010. With the band's March 6 show at Emo's approaching, The A.V. Club caught up with the frontman to talk about outgrowing his old band's sound, making music for kids and dads, and which musical comparison makes him mad. The A.V. Club: North Hills contains a lot of narrative and confessional songs. Is it autobiographical? Taylor Goldsmith: It's definitely autobiographical. It's something that I've always wanted to do. When I hear my favorite songwriters write about things they clearly have not experienced, like "Isis" by Bob Dylan or a lot of Bruce Springsteen songs or something like that, I'm always like, "Man, how do I tap into that?" Every time I tried to do something that wasn't autobiographical I felt pretty phony. So even if it is embellished or elaborated upon, it's always pretty much based on something I have an understanding of. AVC: Simon Dawes was more of a post-punk band. How did you transition into the California country sound? TG: The guitar player in that band quit when I was 21, and I was like, "Man, am I really gonna start over and try this whole thing over again?" It's not like Simon Dawes did anything. We put out one record and we toured for a couple of years, and then once he quit, it was like, "What do I want to do? Do I want to start over and be in a rock band again and try to act like a 17-year-old for as long as I can?" Because that was what I was doing with that band. I decided that if I was going to go on playing music, I was going to try and work on it. So I got into Leonard Cohen and Will Oldham, guys that really inspired me not only as songwriters but also through their music as people, and that's kind of what the shift was for me. AVC: You brought up Dylan, Springsteen, Cohen, and Oldham, and you've been compared to The Band and Crosby, Stills, Nash & Young. Have there been any comparisons that you totally disagree with? TG: Yeah, that's happened a couple times: Billy Joel. It was just, "You sound like Billy Joel." And I get really upset about that. No offense to that guy, but it's not for me. AVC: You did Daytrotter.com's Barnstormer Tour, exclusively playing barns and farms in the Midwest. What was that like? TG: Awesome. It was super cool. People were bringing their kids, their dogs and stuff. It couldn't have been better. AVC: North Hills is one of those records that kids, twentysomethings, and dads can all get something out of. TG: Yeah, but the one thing I worry about with that is whether or not we're edgy enough for the young kids. You know, does a 20-year-old like the fact that he can play it for his dad? Is that cool? AVC: Do you have anything else in the works? TG: John [McCauley of Deer Tick] and I went down [to Nashville] to make a record, just the two of us, and then Matt [Vasquez of Delta Spirit] came down last-minute and did the whole thing with us. My brother [Dawes drummer Griffin Goldsmith] came down, and [former Drive-By Truckers guitarist] Jason Isbell came up and played guitar on tracks one day. We wrote it all in the first two weeks of January and then we recorded in the second two weeks. It was fun. I didn't know if it was going to turn out as well as I think it did. We recorded 20 songs in seven days and then we mixed after that. It was nuts. It was a really awesome time, we were really happy there. AVC: What's the project called? TG: We don't know yet, so if you have an idea, let me know.